Like so many mom-run businesses, Kaya’s Kloset shoes were born out of necessity! Even as an extremely sleepy newborn, Kaya could not keep socks on her little feet. I started making these shoes for her, and then for friends’ babies. A few custom orders turned into a business. Now, an entering Kindergartener, Kaya is running all over and still won’t keep socks on her feet. She wears these in the house as her slippers. 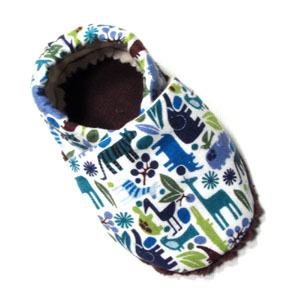 The nonskid soles keep her from slipping and sliding and the elastic at the ankles, that kept her from pulling them off as a baby, now keeps her from running right out of them!